In my time as a childcare professional (nanny), aka, that thing I do to make money because for some reason the internet has yet to appreciate my awesomeness with a salary, I have read a lot of children's books about trucks. And trains. And planes. And pretty much everything with an engine and/or wheels. Except for bicycles, for whatever reason. There's not a big market for children's books about personified bicycles. Anyway, I've read a lot of stories about cars and trucks and planes, and while most of them are bland and dull and a bit nauseating in their repetition, there are a couple of them that stand out. Namely, Katy and the Big Snow and The Little Engine That Could. I only put one of them in the title, because they didn't both fit. These books are worth singling out because they are, as it happens, rather singular. They're unique because in these books, the truck and the train are girls. I feel like this shouldn't be a big thing, but it is. I cannot name how many books about cars and trucks and things with engines that also appear to have souls that I have read, but almost none of them are girls. Like, never. Ever. Not sure why, but for whatever reason, these books are always about little boy trucks and trains and cars and planes. And if there are girls, they're mommies or sisters or friends, and always have some kind of gender signifier attached. They are in some way designated as feminine, as other. But in these two books, that isn't the case. And I cannot express how happy that makes me. 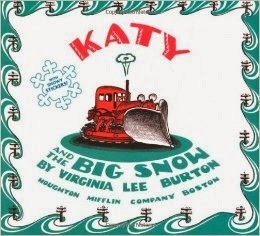 Katy and the Big Snow, by Virginia Lee Burton, was first published in 1943, and you can kind of tell if you get a copy that's been faithful to the original. It tells the story of Katy, a tractor truck who works for the city of Geopolis, in the highway department, and how she saves the city when it's covered in a big snow. Katy, being a very powerful tractor truck, is the only one who can plow the streets when all the other plows break down. 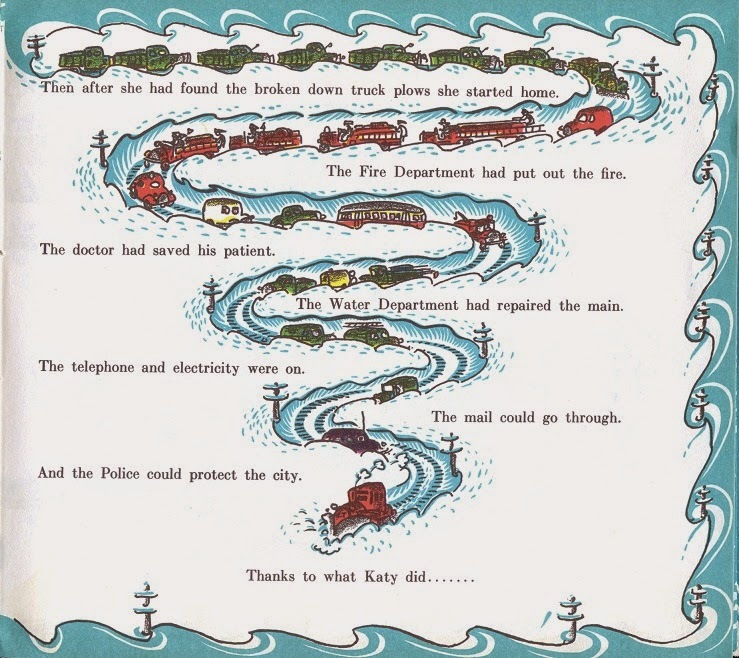 It's a very simple story - Katy is a strong tractor truck, and when winter comes they put on her snowplow. But they wait until the snow is very deep before bringing Katy out. One day the snow is very deep, so Katy goes out, and she plows the snow, going through every street in the city so that the police and the ambulance and the firetrucks and the mail and the telephone company can all get where they need to go, in order to make sure the city of Geopolis stays safe and warm. Once she's plowed out the city, Katy goes back to the Highway Department terminal and has a rest. That's it. That's the whole story. And it is freaking awesome. Why? Because Katy is the hero. She's the one who tirelessly works to save the city. More than that, she's the only one who can. And no one ever doubts that she can do it. At the beginning of the story, when the other snowplows go out to deal with the snow, and Katy stays behind, it's not because she can't handle it, it's because Katy is actually too powerful to be sent out when the snow isn't very deep. She'd end up plowing the pavement off the roads. No, they wait to send Katy out until it's a real emergency because Katy is their star. She's their strongman. She's the strongest plow they have, and when a blizzard hits, everyone knows that Katy is the only one who can save them. Forgive me if I totally love that. 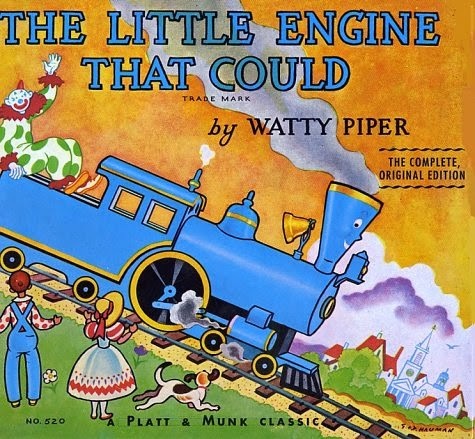 It's a similar thing in The Little Engine That Could, which was written by Watty Piper and published in 1930. 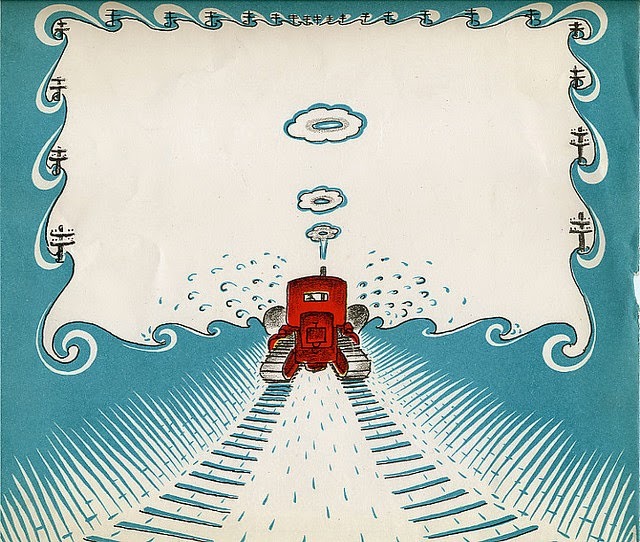 The story follows a train full of toys for the "good little boys and girls on the other side of the mountain". When the engine breaks down, the toys rush out to try to find another train that can pull them over the mountain, or else the good little boys and girls won't have any nice toys or whatever. I don't like this story quite as much, because I find the writing style repetitive and annoying, but I can appreciate the story. It's a modified parable of the Good Samaritan. First the toys ask a shiny new engine, and that engine refuses to take them over the mountain. It's just back from pulling a passenger car, you see, and it's far too important for a little train like them. Next they ask a big strong diesel engine. But the diesel engine has just carried a big train full of important machines over the mountain. It's not going to help them either. Third, they ask a tired old engine to help them, but he's sure he can't. He puffs away going, "I cannot. I cannot. I cannot." Finally, the toys see a little blue engine coming, and she stops right away to ask if she can help. They beg her to take them over the mountain, and even though she is a tiny little train who is only used for pulling trains around the trainyard, she agrees to help. She pulls up the mountain, telling herself the whole time, "I think I can, I think I can, I think I can, I think I can..." And, lo and behold, she does. Again, super simple story that is actually really positive. 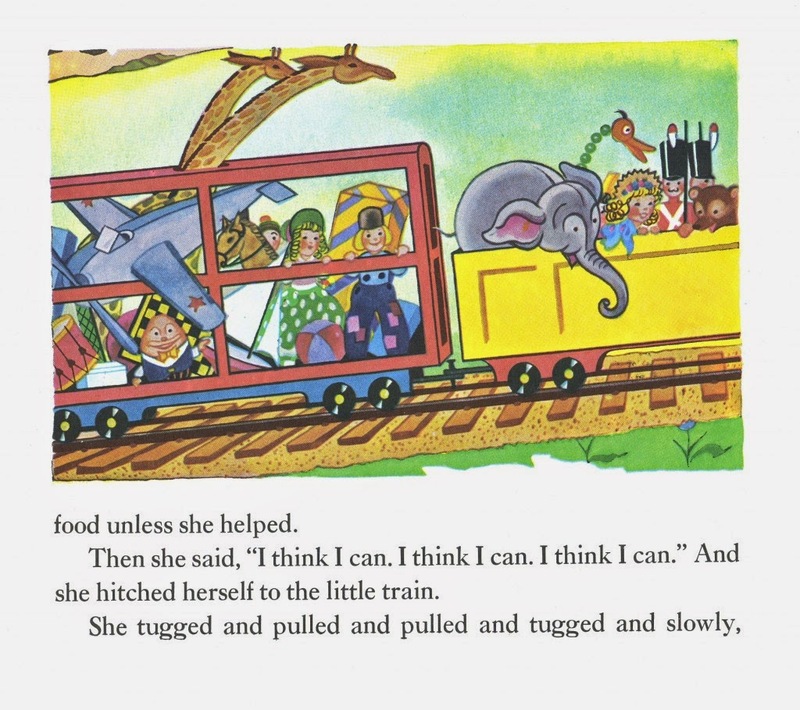 It's great because the little engine is identified in the story as being female, but there are no physical signifiers given in the illustrations. Also, while she is just a little small engine, she's established as being more generous and kind than all of the other engines put together. And finally, it's pretty cool that the whole story is about the whole, "If you think you can't, you probably won't. If you think you can, you might," attitude. I like that. As I said above, though, it's pretty rare to find books like this where the characters are female, and even rarer to find ones where the female characters aren't pushed down by stereotypical behavior or external gender signifiers. The only nod to gender in Katy and the Big Snow is that the story uses a feminine name. The tractor truck herself is just a red machine, with the letters K.T. written on the front. The little blue engine is associated with feminine pronouns, and she's little, I guess, but there are no other signifiers, and that's pretty cool. It's cool because when I read these books to my little charge, I'm telling him that girls can be big and strong or brave and kind too. I'm saying that boys aren't the only ones who can be big strong trucks or kind little engines. I understand that most of these publishers are making the books only about boy trucks and trains and cars because they assume that their audience is male, and want them to relate to those characters, but there's a big problem with that. Boys can relate to characters of any gender, you just have to give them a chance. And when you say that girls aren't ever trucks or trains, you make girls other. It's crummy to do that to little girls who want to be trucks and trains, and it's also pretty crummy to do that to the little boys who are reading these books and learning how to be people. It's also, to my mind, a healthy antidote to the Cars movies, which I hate, where the only female characters are clearly gender signified as such (a horrific overreaching of the "if it's a girl it must be pretty, no matter what" ethos), and have pretty much no bearing on the plot other than as love interests. Katy and the little blue engine are the heroes, and it matters that they're female. It matters a lot. I love the little boy I care for, and I want him to grow up to be an awesome person. Part of that means that I make sure he learns good habits from me and from his sister, but another part means making sure that he has access to all different kinds of stories. It means ensuring that the media he consumes, the stuff that will shape his view of the world and the people in it, isn't shaping him wrong. I have a job, and that job means making sure that this kid turns out okay. So I appreciate all the help I can get.